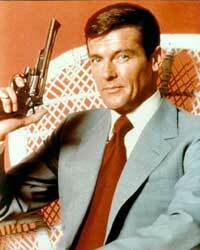 Roger Moore was born on October 14th, 1927, in London. Growing up in a middle class family did not keep him from following his dreams of sketching and art. At the age of 15, Moore was offered a job in an animated film business. Even though he was fired soon, the job taught him important lessons in editing and directing that would become great skills later in his career. In 1946, he appeared as an extra in the film "Caesar and Cleopatra". This role lead him to the Royal Academy of Dramatic Art, where he stayed for a day. After a brief time in the army where he achieved the rank of an Acting Captain, Moore returned to being a struggling actor. During the next few years, Moore worked for the BBC before moving to New York to work in live television and the under contract with MGM studios. The return to London brought Roger better luck. He landed a role and starred in 13 episodes of "The Adventures of Ivanhoe" in 1957. Unhappy with the lad role in "Maverick", Roger went gambling to Las Vegas on the day of reporting to wardrobe. Moore became very popular starting in 1962, when he landed the role of Simon Templar in the series "The Saint", and then in "The Persuaders". When "The Persuaders" failed to achieve big ratings against "Mission:Impossible", Roger was released from his contract to ITC. In 1972, Sean Connery announced that he was finished with Bond, and it was Roger's chance. Albert Broccoli and EON Productions were looking for someone to replace Connery, and Broccoli turned his attention once again to Moore. Roger spent his 45th birthday fighting mosquitos in a Luisiana swamp. Roger went on starring in 7 James Bond adventures, holding the record for the most 007 films by one actor (Connery-6, Dalton-2, Brosnan-4, Craig-4, Lazenby-1). 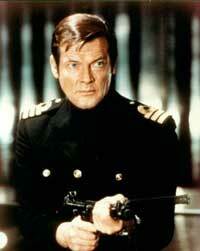 Moore retired from being James Bond in 1985, after the release of "A View to a Kill", at the age of 57. Recently, Roger is involved with UNICEF, helping children world-wide. Roger had a role in such films like "Quest", with Jean-Claude Van Damme, and The Spice Girls movie "Spice World". After Sean Connery returned for one last "official" Bond film, the Roger Moore era began. Perhaps the farthest from Fleming's Bond, Moore brought an over exaggerated comedic attitude to the role. My largest qualm with his portrayal was that he never showed any emotion and that often made his scenes unbelievable. It seems that even at moments where his life was in serious jeopardy he had a smirk on his face and a smart-alec remark ready to go. Moore could never pull off a scene like the one in Goldfinger with Connery and the laser table. To make matters worse, Roger Moore stayed with the part for too long. By the time he stopped Max Zorin in A View To A Kill he looked like he should have been receiving social security. At the same time as he was getting older, the character of Bond was relying less and less on his own skill and whit to get him out of troubles. Rather, Q's gadgets or pure luck seemed to be Bond's calling card towards the end. Whether this change was a direct result of the fact that he was not believable as a secret agent is unknown: but I think it is.